Dr. Joshua Sun completed dental school at Zhejiang University in China where he received his Doctor of Dental Medicine as well his PhD. He then went on to complete his Oral & Maxillofacial Surgery residency at Shanghai Second Medical University in China. After relocating to the United States, he completed his training in periodontics at Loma Linda University in California. Dr. Sun taught for six years in graduate periodontics as an associate professor at Loma Linda University. He has been practicing periodontics and implant surgery for more than 6 years. Over the years, Dr. Sun has published more than 30 articles in peer reviewed journals as well as in two book chapters. 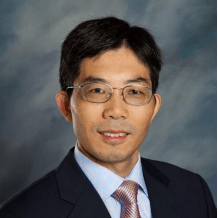 Dr. Sun is a Board Certified Periodontist and is a member of multiple professional organizations including the American Academy of Periodontists, the American Dental Association, the Tri-County Dental Association and the Academy of Osseointegration. He has also received multiple awards including the 2009 Excellent Proficiency in Residency Training award, the 2009 Edward Ko Basic Science Research Award and the 2013 Educator Award from the American Academy of Periodontology. When not practicing dentistry, Dr. Sun enjoys spending time running, doing outdoor activities, reading and traveling with family. What makes Dr. Sun smile? Dr. Sun is proud of his family which includes his wife, Li, and his three children including his two sons and daughter. We cannot wait for you and your family to meet Dr. Joshua Sun!